Merged radar quantitative precipitation estimates (QPEs) from the high-resolution NEXRAD reanalysis over CONUS with rain-gauge observations (GHCN-D, HADS, CRN). Performed bias-adjustment of the radar-only product at the daily and hourly scale for the period 2002–2011. Currently implementing and testing techniques for optimally merging the rain gauge datasets and the radar-only estimates (inverse distance weighting, kriging, and variants). 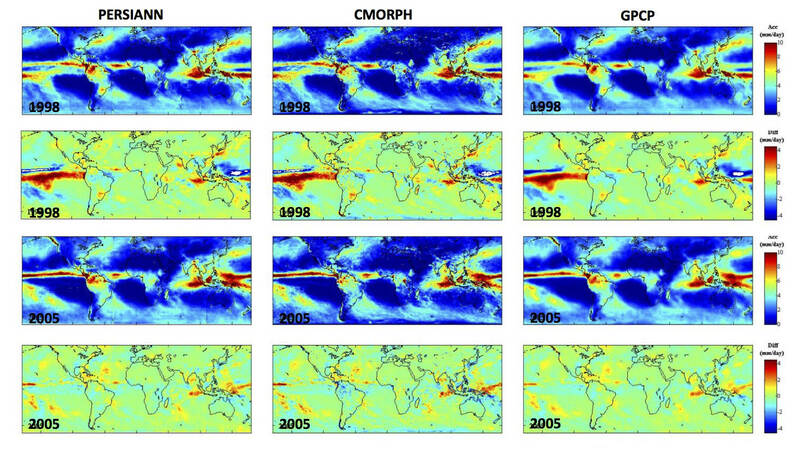 Work is progressing on the evaluation of using quantitative precipitation estimates (QPEs) derived from satellite observations to derive long-term global precipitation characteristics at fine spatial and temporal resolution. This is part of a broader effort to develop Reference Environmental Data Records (REDRs) for precipitation. Three papers have been published in the past year. Annual rainfall derived from current or in-transition Reference Environmental Data Records (REDRs) PERSIANN, CMORPH, and GPCP for the year 1998 (upper row) and 2005 (third row) and corresponding anomalies for 1998 (third row) and 2005 (lower row). Lead author of a manuscript published in Hydrology and Earth System Sciences (HESS) on the evaluation of multi-sensor precipitation estimates over CONUS.